The Mong Ton Dam, also known as Tasang, is one of the seven proposed dams in the Salween river in Myanmar. If completed, it will the largest dam in the country. So far, up to 300,000 people have been displaced. 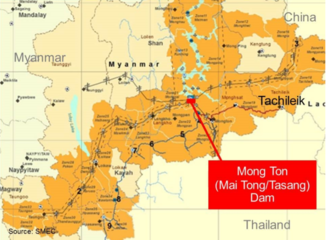 Also known as Tasang dam, the Mong Ton project is a proposed dam in the Salween river, one of the largest rivers in Myanmar that flows through most of the eastern part of the country. With a projected capacity of 7000MW , the Mong Ton dam is one of the seven dams planned in the Myanmar section of the Salween river, also called Nu River in China and the Thanlwin River by the Myanmar government, and it will be the largest hydroelectric dam in Myanmar if completed. It will be located in southern Shan State, an area prone to ethnic conflicts. The Tasang project has been on the government's agenda for a long time. The first study of the project was conducted in 1981 by the Japanese company Nippon Koei and a contract was signed with the Thai developer MDX Group . 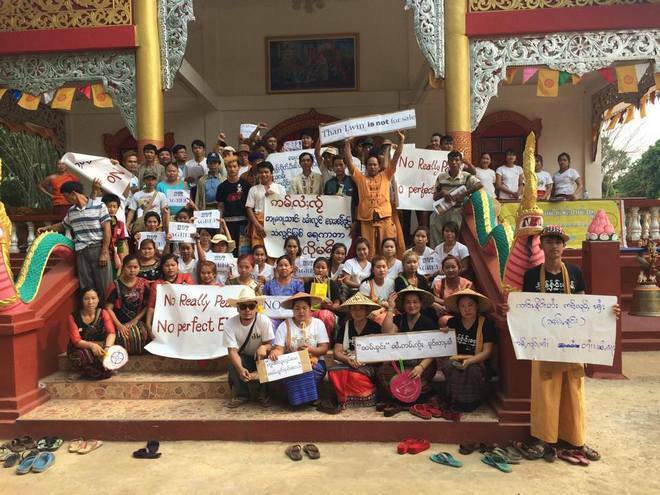 In the late 90s, the government tried to push the project and started a forced relocation campaign that has affected between 200,000 and 300,000 local villagers. However, the construction stalled due to civil unrest in the area. In 2009, the contract with MDX Group was canceled because the construction was not going fast enough and a new contract was signed with the Electricity Generating Authority of Thailand (EGAT), a Thai state enterprise. The China Three Gorges Corporation, the China Southern Power Grid and Sinohydro Corporation are also involved in the project, according to news reports  and activist groups . The total cost of the project remains unclear and figures range from USD6 billion to USD14,5 billion. According to several environmental groups, the dam and its reservoir will cause major environmental and social impacts. Logging concessions have already been granted for the areas that will be inundated by the reservoir. Some villagers still live in the areas that will be covered by the reservoir and will likely face relocation if the project is completed. Women will also be more impacted “due to their vulnerable socio-economic conditions at their household and community level”, says a paper . Activists have also raised concerns about irregularities in the environmental impact assessment consultation process . Some groups have also challenged the official version about the benefits that Myanmar will get from the project because most of the energy produced will be exported to Thailand. The money will also go mainly to the companies. Thus, according to the contract signed for the project, revenues will be split between the companies and the Myanmar government on a 90/10 scheme, companies getting 90% of the revenues while giving 10% (often in the form of electricity) to Myanmar. According to a research , under this revenue sharing contract, the Mong Ton project will generate about US207 million a year to the Myanmar government. Nevertheless, other similar projects “pay 3-4 times more than the “90/10” contract”. With several rebel groups active in the area, groups also fear that the construction of the dam will reignite the conflict in the region . MDX Group from Thailand - The first study of the project was conducted in 1981 by the Japanese company Nippon Koei and a contract was signed with the Thai developer MDX Group. In 2009, the contract with MDX Group was canceled because the construction was not going fast enough. Other The reservoir will inundate a vast area that is now covered by primary forest. Logging has already started. The dam might also disrupt the hydrology of the river. Other Between 200,000 and 300,000 people have already been displaced to clean the area for the reservoir. If the dam is built, more people might be displaced. Women will also be more impacted due to their vulnerable socio-economic conditions at their household and community level. There is no construction activities at the dam site, but the project has not been officially canceled. Development of Alternatives Local groups propose to cancel all the dam projects along the Salween river and look for alternative sources of energy. Why? Explain briefly. The project is still on the government's agenda and might push it forward if a peace agreement is reached with the rebel groups. 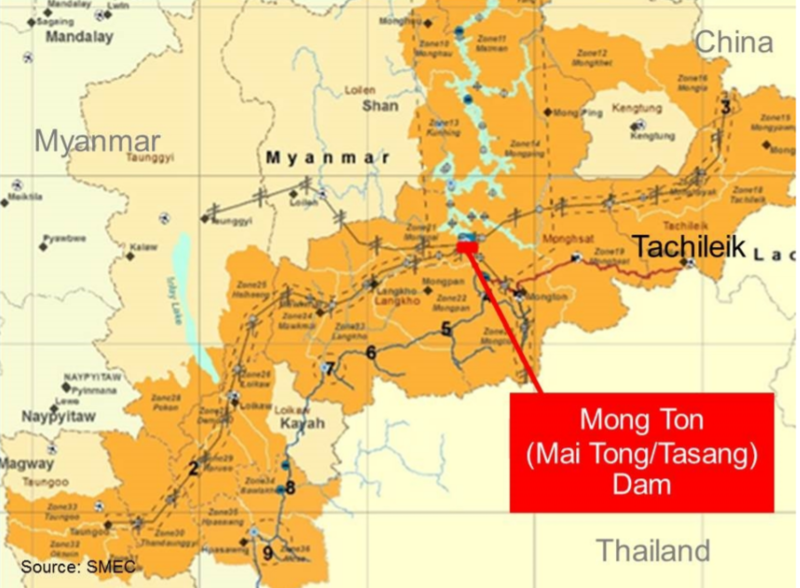 Brief summary of Mong Ton (Mai Tong/Tasang) Dam Project 1 (July 2016). Towards Ecological Recovery and Regional Alliance(TERRA). The Salween Under Threat Damming the Longest Free River in Southeast Asia. Salween Watch, Southeast Asia Rivers Network (SEARIN), and the Center for Social Development Studies, Chulalongkorn University. October 2004.